I have been friends with Michael on the internet for some time and we have talked a lot. I have had the pleasure to work with him in the past, releasing his previous project The Raspberry Heaven on Z Tapes. He is a very kind and honest musician and I am a very big fan of his music. 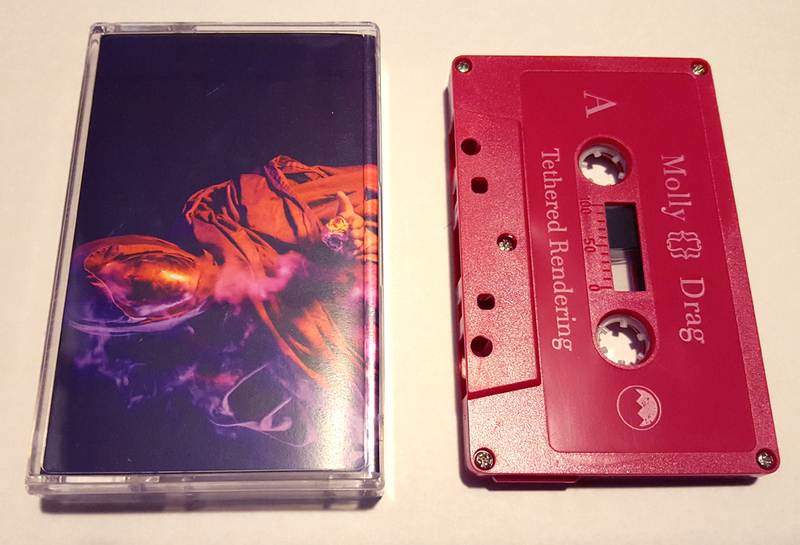 It is very hard to find the right words to describe his new album, Tethered Rendering under the moniker Molly Drag, released on cassette with the great label Broken World Media. As English is not my native language, I have been struggling to express certains feeling I have when listening to albums like this one. For sure, it’s different from anything that Michael has written so far. The vibe is more ambient and dreamy than rest of his catalogue. However, the sadness in Michael’s voice still remains. Tethered Rendering exudes, for me, those lonely winter evenings when you think about your life, family, friends and feel little bit sad. It’s cold outside, there’s a lot of snow, but it’s beautiful. Even though the music has a very sad, emo-ish feeling to it, it is not actually making you sad. You just sink into it more deeply and you experience it on your skin. It gives you chills. Listening to it over and over I have realized I am falling in love with its songs more and more. I also begin to hear its many influences. The new album is reminiscent of the classic Orchid Tapes sound. Especially present is the influence of Fog Lake or even Ricky Eat Acid, and I love that. The similarity is most present on “Rabbits” or “Tethered Rendering”. Over the last few months, I have grown very fond of Canadian musicians, and Molly Drag further justify the investment. The folk music influence many Canadian artists are incorporating into their music, what is very relatable to me. You can close your eyes, forget that you at your day job and fly away to land of beautiful music. It speaks to the quality of Michael’s songwriting that there is not one weak spot on whole album. You can listen to it from the beginning to the end and never feel bored or disappointed. Every single song is stands out on its own, driven by beautiful guitar melodies, gentle drums, or various samples. And that voice! Michael is able to captivate you thoroughly through his gentle sad, almost crying voice. It is the most consistently amazing thing about his music. Words are very limiting in describing what I feel when listening to Molly Drag’s Tethered Rendering. It’s foggy day, it’s raining and snowing, it’s cold outside, and I have a lot of work to do, but there is Michael music – filling up this moment and easing the burden of life. It makes me smile, makes me never want to stop listening to it. And I will not. Please buy cassettes or download digital music.